By the time you are in the second week, you’ve already heard and read a lot about a movie, typically. So I had heard that “it’s a long movie”, that “it doesn’t have much of a story”, and even that “YOU won’t like it”. I wonder about that last suggestion! Especially in hindsight after having seen the film. Wonder what made the person feel that I won’t like it. Whatever are the kind of signs I have given about the kind of films I don’t like (well, there ARE the obvious ones that I have shared, e.g. dislike science fiction, cartoons, and the like – this was none of those kinds..!). These reactions had not clouded my expectations, just tampered them! Knowing the star cast, and knowing that it was a modern day setting, Dharma Productions flick, there would be certain good-feel factors like great locations, style, music, etc. And then anything else that is also good, will be a good bonus. In reality, I found a lot of factors that worked for me, in the movie. And I quite enjoyed it, and would recommend as a good-see, to anyone who’s considering going for it. While the story is so-so, there are very interesting characters. Like the girl who’s always been a loner, focused on studies and topping classes, to some extent under the influence of her family, and to some extent maybe, because that’s what she’s always believed to be the right thing to do. Till the time that she, perhaps for the first time in her life, takes an impulsive plunge to go on a trekking trip, and which becomes a life-changer for her. For being able to discover herself, for knowing that there is more to life than just being “proper”, that life is meant to have fun too. 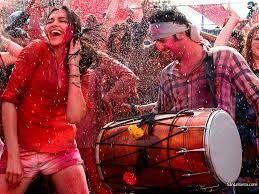 The transformation of Deepika’s character in this manner was a good moment, in the film. I have never thought much of Deepika’s acting. Have thought of her as an average actor, at best. But she does a decent job here. Maybe the ‘coming-back-with-Ranbir’, even if it was just for the one film, worked well for her! A lot of films with two stars, and two supporting actors, can leave the actors’ characters from showing up. Here we see a good glimpse of the desires, the emotions, the pangs, of the two supporting actors as well. Kalki and Aditya Roy Kapur, in that sense, have good roles and have done a decent job. That brings us to the one star of the show. Ranbir Kapoor is awesome. Here’s one more after Wake Up, Sid, Rockstar and Barfi, where he gives an outstanding performance. He can act with his face, the expressions tell a story. His appearance looks so real with the character he plays. Yes, he’s got it in the genes from Rishi, and then he’s gone and improved upon them. Amongst the young breed (and I would classify Hrithik as not-so-young now), he is clearly ahead of the pack, where dancing goes. Perhaps also where acting goes. The character he plays is one that we’d find amongst the youth today. Not everyone, but not exactly a rare breed. One who has the confidence to NOT do the typical. One who feels that this is the one life, and one must fill it with the best of times and the best of moments, and live it to the fullest. Why must you be like everyone else? Very interesting attitude. The film makes it appear to be a little selfish, and there is a degree of self-doubt towards the end. But it is an amazing feeling. Which travel enthusiast sitting in the cinema would have not drooled over the offer to be in 4 different cities of the world for 3 months each, and also be paid for it?! Clearly an aspirational character in a way. The locales are well chosen, from Manali to Paris to Udaipur, and many others, there are some lovely scenes for the eyes to satiate. The music of Pritam is good. Many of the songs are very hummable. Last but not the least, it is always so awesome to see Madhuri Dixit on screen. She continues to amaze with her dancing, and retains her magical smile. Wish she returns for a longer role in some film soon.. ! She gives grace to what could have been other terms, just another ‘item song’! It IS somewhat long as a movie. 3 hours all in all, inclusive of the interval. But quite an enjoyable three hours overall. Did you see it too? What did you think about it? Totally agree with your review. I will start by mentioning awesome acting of Ranbir. He has been improving with each movie. After watching Rockstar & Barfi, I was sure that he’s going to be a great actor in the coming years. The best aspect about this guy is that he has shades of all the Kapoors. He makes acting look so effortless. Moving ahead from the Ranbir’s acting, we should talk about the story. Frankly speaking, the story was average. The ending could have been way better. There were many cliche` in the movie, which could have been avoided. Direction was weak in some parts, which made the story below average. But, considering the fact that Ayan is hardly 25, so I believe he has done a great job. He was also the director of Wake up Sid. I hope that this pair goes on to become cult like Karan Johar & Shah Rukh Khan or Tarantino & Robert De Nero. We want more such associations because they bring out best in both the individuals. Both Kalki and Aditya did a fine job. Actually, Aditya is still an underrated actor. I hope to see him become a superstar in the coming years. Why is Mr. N. Srinivasan, BCCI Chief, having a press conference today, few hours before the IPL Final?